Welcome to the Lolnet FTB Unleashed Server! We have a global community, with players coming from across the world including New Zealand, Australia and the USA - Everyone is welcome! Lolnet is a Gaming Community providing for New Zealand players and to the global including, Australia, USA and Asia. 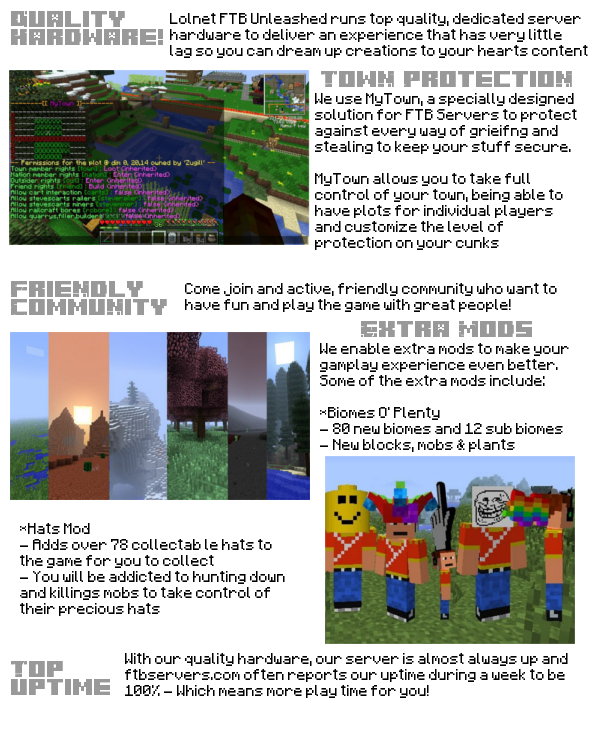 Website and Forums - Visit our website & forums www.lolnet.co.nz to chat about games, gaming hardware and of course your favourite Minecraft servers. Join our forums with over 9400+ registered users. Mumble Voice Chat - We think games are better when you talk to people and so we host our own low latency Mumble Voice Chat server. We have channels for our servers as well as channels for those of you who like to play DoTA2 and League of Legends in their spare time.